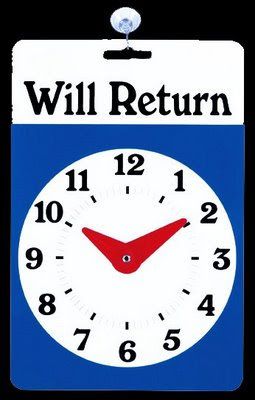 We've been AWOL for a few days, and will need a few days more before we're back to full operations here at Spring Water Designs. My dad took a fall on Friday and broke his hip, and had surgery for a partial hip replacement on Sunday. Because he suffers from dementia (and now in the hospital ~ out of his regular element it's a lot worse) I have to be there to make sure he's doing ok, getting the right treatment, and sign papers for him. I'm the only relative he has here in Maryland. So of course I'm getting little sewing done, and I haven't had much computer time, but I have made the best of hospital-room time by knitting ~ I knew there was a reason I learned how to do that this year :) Dad will be entering a rehab facility this week, and it remains to be seen if he can go back to independent living after rehab, so I have a lot of arrangements to be looking into in the near future. We are keeping up with sales here, and I will be focusing on customer orders, but bear with me, I anticipate my blog posts will be spiratic for a little bit, until I get things settled (and have something of interest to blog about) ~ but I will return! So lately it's been all about making blocks. Slowly but surely they will become quilts one day. This is my first block of the Thimbleberries Club quilt for this year. I'm working on the shop sample now, and the fabrics should all be in for us to start the club in March. In Month One we will be making two of these little trees. Sometimes just focusing on one block at a time, and not the whole quilt makes for a more relaxing and enjoyable quilting experience. Enjoy the Process & Enjoy the day! Remember that sock class that I'm tackling as my New Year's thing to learn...well here's the progress that I'm making after restarting only three times. For some reason I find that I need to do something at least three times with the knitting before it starts sinking in. Today I was feeling under the weather so I took a sick day and spent most of it in my comfy chair knitting, and I turned my first heel! Don't look at it too closely, it's far from perfect, but I'm happy with it so far ~ and it fits my foot (so I get to keep this pair Starlyn!). We have one more class next week where we learn to close the toe. And for the people who asked what fabric I used for the tote pocket: It's from a collection called "Close to My Heart" designed by Laundry Basket Quilts for Moda Fabrics. The other day, just for fun, I whipped up this simple tote bag from a Moda pre-quilted fabric called Millhouse Inn. I made an easy patch pocket for the inside and the outside and covered a piece of tag board for the interior bag bottom, and because the main fabric is pre-quilted there is no lining and what not so it all goes together really quickly. This is block number two from a block of the month that we are doing at the shop this year. It's from the book called Women of Influence by Sarah Maxwell & Delores Smith. 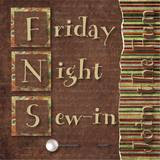 It is a nice mix of some pieced blocks and some applique. I have to work at the shop today, but I'm soo ready for the virtual Friday Night Sew-In tonight ~ maybe I'll get something finished this week. So instead I'll show you two quilts I finished last summer. The patterns for both are in Quilt Almanac 2010 on the news stand now! 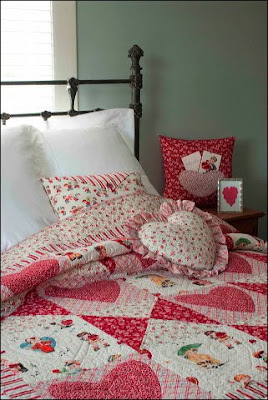 This Valentine quilt called "Heartfelt Love" I made with the Love Notes fabric collection designed by Faye Burgos for Marcus Brothers Fabrics. This cute little one is 62" square, not too big so I quilted it myself. ...And my Christmas Quilt, "Winterberry Wreaths" made with the Christmas Magic collection designed by Lynette Anderson for Henry Glass Fabrics. I like this one because while it has holly wreathes and little reindeer in the border, it's not too Christmasy and can stay on the bed for a while before and after the holidays. I had Maria O'Haver of Pangor Design Studio quilt this one for me, and as you can see here on the back she did a beautiful job using holly, and reindeer for a cute whimsical look. This is a big one (82" x 106"), I needed two guys to hold it up on our back deck to snap a picture of it! As soon as they update their website, all of the pillows that you see (and the little fabric Valentine postcards) will be free downloadable patterns at Quilt Magazine's website. Friday Night ~ It's a Date! What will you be doing on Friday Night? How about a virtual Sew-In ~ complete with prizes! Read about it here on Heidi's blog, then join me...put on some comfy clothes, grab some chocolate, and spend Friday night doing something you love! I Can Smell the Jelly Roll Baking! I'm sending you an email, send me your address so I can get your jelly roll right out! 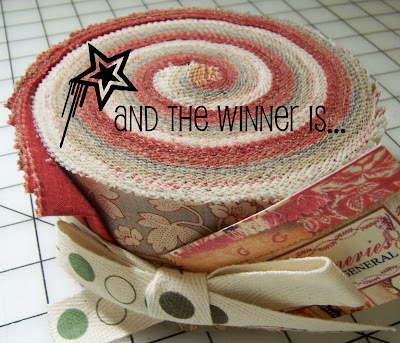 For ideas to use jelly rolls and other Moda pre-cuts check out the Moda Bake Shop. The Moda Bake Shop provides online "recipes" (patterns or tutorials) which you can use with the different Moda Pre-cuts. All sizes and types of projects are featured from various designers and shops. Tip: There is a link called "Bakery" at the top that will take you to a menu where you can choose a pattern by type of pre-cut (jelly roll, honey bun, etc). I've been getting asked about the fabric that I used in my Retro Clothespin Apron that is featured in the current issue of Quick Quilts Magazine (Issue #107). The collection is called "Just Dreamy" by My Minds Eye for Riley Blake Designs. Besides Quick Quilts, you can also find the pattern in the current issue of Quilt Magazine (Feb/Mar Issue #108) made in Oops-a-Daisy fabrics from Blanks Quilting. (The Quilt Magazine website also has up my Daisy Chain quilt pattern free download from issue #108). For anyone who is having trouble finding the Just Dreamy fabric, I had enough to cut two Apron Kits and have made them available in my Etsy Store. 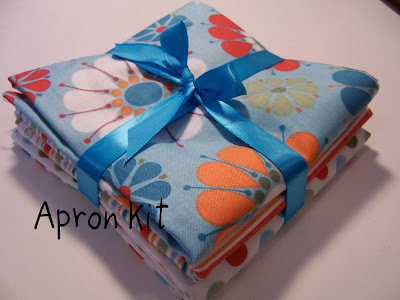 I have to see if I can get a hold of any more Oops-a-Daisy fabrics to make kits for that one. Well I went ahead and did it ~ for no good reason...it doesn't meet any of my deadlines, it's not for the shop, a customer, or for a gift...I just did it for me, It was just too cute! I went ahead and made the first block from Anne Sutton's Snowbound Block of the Month. I don't know if I'll keep up and do all of them, but this one just kept calling me to make it, so I stayed up way too late last night and finished it. In keeping with my theme of Simplicity, I thought I'd feature my little Clover blue line pen for my Friday Find. It's not a recent find (you all probably already know about it), but I use it almost daily. There are several brands on the market, but this one is my personal favorite, it makes a nice fine, crisp line that works great for marking stitchery or applique, and I've never had a problem with it coming out with water. Small details, but big things. Some of you took part in the Tisket a Tasket Free Block of the Month from Bunny Hill Designs in 2009 and may already know about this, but I wanted to share that Anne Sutton is offering another Free Block of the Month for 2010! 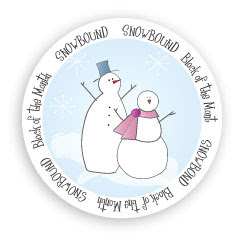 It's called Snowbound, and features cute little snowmen. I've pasted the link on my sidebar for easy finding through the year. I did finish some of the basket blocks from last year, and have several more prepped and ready to stitch. Unfortunately work projects sidetrack me from these fun things, but I'll get back to them at some point, they are just too cute not to finish! In keeping with my theme of Simplicity for this year, I started off 2010 with my first project being a simple light-hearted little ditty. With the cold winds blowing outside, it was nice to sit in my comfy chair in the evening, wearing my new nappy socks, and drinking hot tea while binding this little guy and thinking of Spring. It's called Wild Rose Table Runner and the pattern can be found in Quilt the Seasons Book 2 by Pat Sloan. I even got it finished early for this month's Sloanies club meeting...bonus! I worked all weekend, but I don't have much in the way of finished projects to show for it. Yesterday was Civil War Sunday though, and I prepared a little Dear Jane block to work on. So we started with some goodies to sustain us. Then my friend Tiffany brought the second course. Don't they just look like a yummy little four patch block? And with the help of some hot tea, I finished L-13 last night to add to my small, but growing Dear Jane block collection. I used the tutorial from That Quilt Blog and it worked great! Here's to Simplicity in the New Year! I thought I'd dig into the New Decade with my theme word for the year. If you read many blogs, you most likely have seen posts about choosing a theme word to focus on in the upcoming year. Ali Edwards started choosing a word on her blog and the idea has kind of caught on with other bloggers that I read regularly like Pat Sloan. were of simple things around me, of the people and things in my life that I love. Here's wishing you all a very Happy New Year!